For the most part, I strive to remain positive about everything. I acknowledge that my relationship with my ex is a mess – but I try to make it better by creating boundaries and acting in a respectable way. I have outstanding physical and mental issues as a result of the accident, but hey – I’m still walking and talking and I’m going to keep doing that as long as I can – because tomorrow isn’t guaranteed, no matter who you are. And then there are days like today. Today, I have pain. Probably because of the snow and general weather. (Damn snow). But today, both of my legs are aching something fierce. I’m not averse to taking medication for the pain (and I have) – but it’s days like today when my inner voice starts to get overwhelming. What if today is the first day of the downward slope where everything gets worse? What if the pain get so bad I can’t walk any more? What if the pain get so bad I can’t concentrate and can’t work any more? Even worse – what if I can’t parent any more? It’s rare – and if I didn’t have those moments, I’d probably be a little further ahead. But the clouds that gather over my head do remind me to enjoy today. I have no power over whether or not the pain stays around. My power comes from refusing to succumb to the worry. I’m taking it back now. 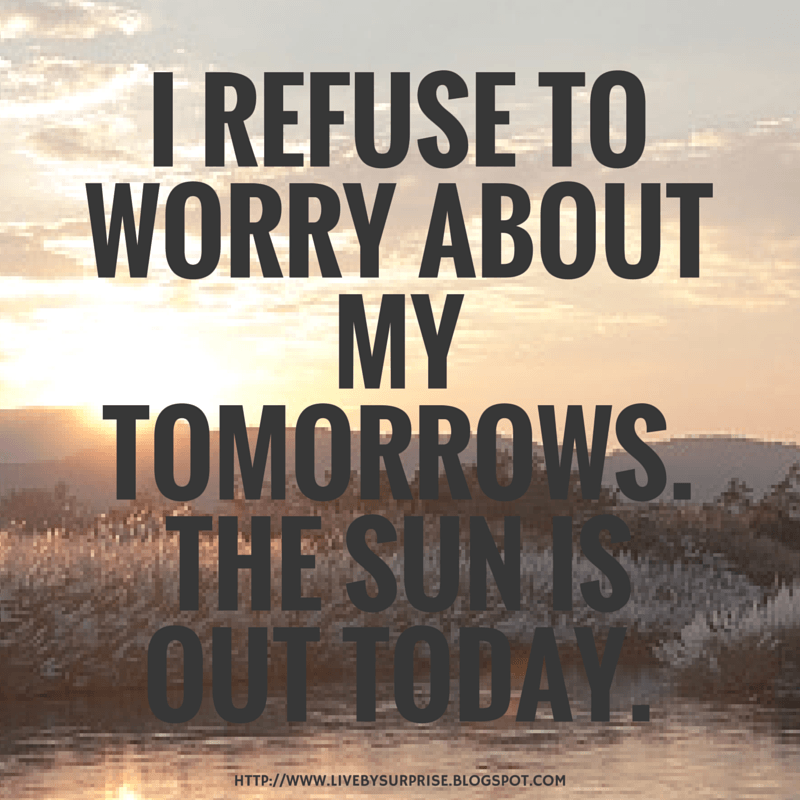 I refuse to worry about my tomorrows. Clouds or not – the sun is out today. And I will enjoy it. Tell me – what have you done to enjoy today?